Neither of us were hungry for a full dinner, but we did need something in our stomachs, so we combined a beloved snack with some leftover veggies that we had in the fridge. 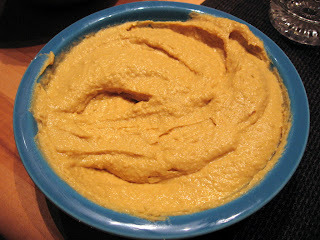 Puree all ingredients and use as a dip, spread or condiment for almost anything. We often use zucchini sticks for dipping but we had some thick broccoli stalks in the fridge so we peeled them on chopped them up too. They were surprisingly good--crunchy and mild in flavor. Giao loves chicken divan, but he uses a recipe heavy in mayonnaise that Alexis is not particularly fond of. So, when she saw a no-mayo version in Saveur Magazine, she decided to give it a shot. She did modify the recipe liberally, and ended up producing a dish that didn't taste much like Giao's beloved chicken divan, but was quite good in it's own right. Adapted from Saveur magazine. Serves 5 hungry people. Season the chicken breasts with salt and pepper and cook in the olive oil over medium high heat for about 10 minutes, until not quite cooked through. Make sure to turn so that both sides are evenly browned. The recipe in Saveur called for cutting the chicken into strips after sauteeing, but because you later bake the whole dish, this led to chicken that was a tad too dry. Next time, I'd leave the chicken breasts whole. Whatever you do, set the chicken aside to rest. Meanwhile, boil the broccoli for about 1 minute, drain and set aside. In a saucepan melt the butter and then mix in the soy and wheat flours whisking continually for 2 minutes. Add the half and half and chicken stock and simmer until the sauce is very thick, stirring often. This will take about 20 minutes, but if 20 minutes has passed and it's still not "really thick", keep going. When sauce is at desired thickness, add the vermouth, the nutmeg and 1/2 the parmasean. Season with salt and pepper and stir to combine. 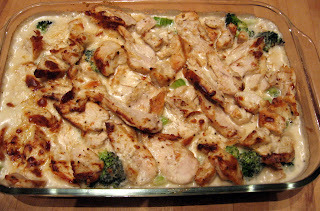 In the 9x13 greased baking dish, dump in the broccoli. 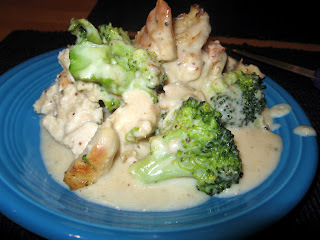 Then place the chicken breasts on top and finally pour the cream sauce over the whole dish evenly. Sprinkle the rest of the parmasean on top and bake on 350 for about 20 minutes, until the top is golden and the sauce is bubbly. 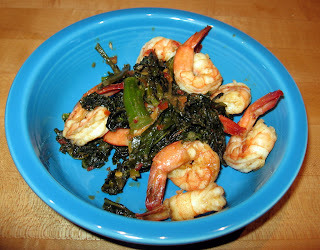 I saw a recipe for Chinese Broccoli with Anchovies in your publication a couple of weeks ago and thought it sounded both interesting and tasty. I thought to myself, "I have Chinese broccoli AND anchovies in the house right now. I don't even have to go to the store!" I don't usually cook from recipes (I can't help but modify as I go) but I decided to go forward with my own adaptation of the recipe. The only thing I felt was essential to leave unmodified was the ratio of anchovies to Chinese broccoli, as anchovies are very salty. Let's just say that that ratio was way off. The dish was too salty to eat. This dish was an absolute disaster--such a disaster that I feel unable to repeat the original recipe, or my adaptation here for our readers. Such a disaster that I can't even venture to guess what the ratio should have been. Please, in the future, test your recipes before printing. We decided to cook dinner for breakfast for a change of pace. Ever since Alexis first make this fenugreek creme sauce from Vij's cookbook last Christmas (while quite tipsy), she has attempted to make it (sober) several times. Everytime, the sauce breaks. This time, however, she had a breakthrough and used half and half instead of heavy cream and lo and behold, the sauce didn't break. And it turned out thick and creamy. Yay! The modified recipe is below. These were surprisingly delicious for breakfast and when we got home from work, the house was fragrant with Indian spices. Mix the lemon uice, salt, paprika, cayenne and fenugreek leaves to the half and half and let sit for 20 minutes to thicken a bit. Sautee the garlic in the oil over medium high heat, stirring constantly, until the garlic is golden. Add the turmeric and sautee another minute. Add the half and half mixture and simmer over low heat until thick, stirring constantly. Grill the lambchops on the George Foreman for a few minutes on each side. 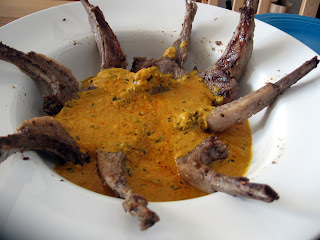 Then arrange in a serving dish and pour the sauce over the top. 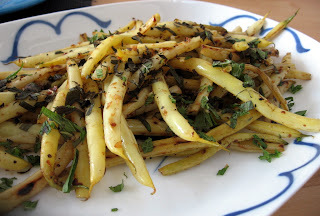 As a morning side dish Alexis decided to make a light dish of yellow wax beans. They were a nice, healthy contrast compared to the delicious, but not so heart healthy, cream sauce. Sautee the garlic in a bit of olive oil until slightly browned. Add the beans and cover. Sautee for a few more minutes, until tender. 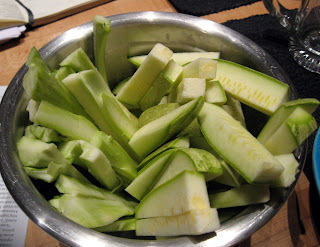 Then season with salt and pepper, sprinkle with lime juice and top with the chopped mint. It's football season again and that means it's also time to grill. Since we thought we'd be feeding more than just a few people, we picked up several pounds of tri-tip at Costco, created a wet-rub and marinated the meat for about 24 hours before grilling it to medium rare. We ran out of chili pepper and used cayenne so this meat packed a punch. However spicy, everyone seemed to love it and it was devoured in no time. Grind the garlic and salt together with a mortar and pestle. Add this mixture to everything else and combine until smooth. Rub all over the meat, seal in a ziploc and place in the fridge for up tto 24 hours. For slightly tough cuts like tri-tip, it's important to let the meat rest for about 10 minutes after taking it off of the grill and then cut on a diagonal across the grain so that you sever the long muscles. 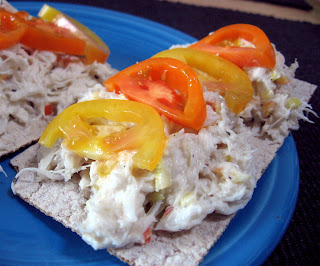 Canned Crab: Yay or Nay? We decided to buy a tub of canned lump crab meat from Costco, Chicken of the Sea brand. We could see through the tub and the lumps looked pretty tasty so we decided to give it a shot. Our previous experiences with canned crab had not been so great, so we were pleasantly surprised when we tasted our creation and it was fresh tasting and delicious. And, I didn't have to crack any crab legs. Mix all ingredients thoroughly and serve with crackers, or in lettuce cups, etc.